Author Peter Wright identifies and outlines five parameters -- Power, Weight, Tire Grip, Drag and Lift -- and shows how each can be maximized. In addition, he describes the variety of technologies (including those that have been banned over the years) that are involved, not just in the makeup of the Formula 1 cars, but also in the component manufacturing, systems testing, and the actual racing of the cars. 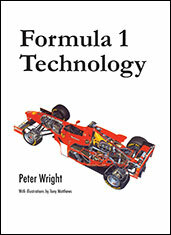 If you do not have access to SAE MOBILUS via username/password or institutional access, you can still purchase the Book, Formula 1 Technology.